As a runner myself, I have felt the aching or sharp pains to the lower legs. I recognize the pain after running that takes time to improve even when the running has stopped. I also see individuals on a regular basis complaining of "Shin Splints". In fact, shin splints are relatively common and can best be described as an overuse injury during exercise. Shin splints are a strain of the muscle insertions in the lower leg from overuse of a particular muscle group. This can occur because of walking or running instability from being too flat (pes planus) or having a high arch (pes cavus). As you run, especially if you progress too rapidly, these mechanics cause certain muscles to be overworked and start to hurt. One big concern with this type of pain is it may progress to a more serious problem called a stress fracture. Although you can run with shin splints (with proper treatments), you can not run with stress fractures. Anterior Shin Splint: This type of shin splint is localized to the front our outside (lateral side) of the leg and is a very common form. 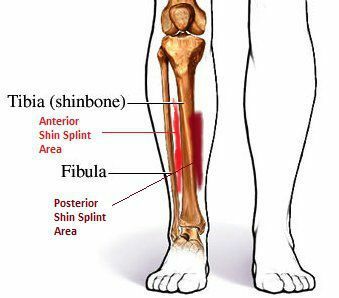 It causes significant pain to the area between the tibia and fibula in the lower leg and is acutely painful with any touch to the area. Posterior Shin Splint: This type of shin splint is localized to the inside (medial side) of the leg and usually presents as pain between the legs. This is often misdiagnosed as a calf strain. Proper Stretching - Stretching before and after exercise are a key to reducing injury. Proper Shoes - Shoes should be chosen based on the activities participating in. Old shoes can also lead to this problem. Proper Exercise Regimen - In starting an exercise program, use care to not progress to rapidly. Improper progression can lead to injury also. Orthotics - Specialized devices designed to accomodate the foot and promote proper walking or running. As the foot functions in the "ideal" neutral alignment, shin splints are less likely. Tape the shin area, protecting the attachements of the muscles to the bone, can lead to improvement of the pain. Rest if pain doesn't improve. Rest and time off from activity may be required to resolve the problem.